As we start our 2014-2015 Season, we want to take a few moments to welcome you back and show off a new look—both in the theatre and online. When you come to Shakespeare Theatre Company, everyone who attends will receive the ASIDES, a merged publication that combines our show program with Asides, our dramaturgical magazine. This new publication will allow everyone access to the in-depth production articles from ASIDES, and we hope that you will enjoy reading it, learning more about the plays and even take it home to savor after the show. 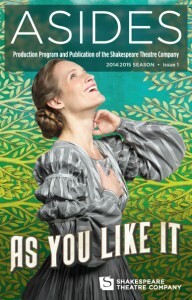 Check out the new ASIDES when you see As You Like It, now playing at the Lansburgh Theatre. Online we are growing, too. Our plan for this season is to expand the ASIDES Online to a regular blog, where you will be able to read extended versions of the printed articles, have access to photos and video content, get more behind-the-scenes features about our production and programming, as well as hear personal stories from many of STC’s staff, artists and actors. Thank you for your continued support of STC and ASIDES, and happy reading.